BELLEVILLE – The night sky has been a tool used for guidance and storytelling for thousands of years. Another chapter will be added to that story this weekend as Comet Wirtanen will pass between the Pleiades and Hyades star cluster on Saturday and Sunday night during the annual Geminid meteor shower. 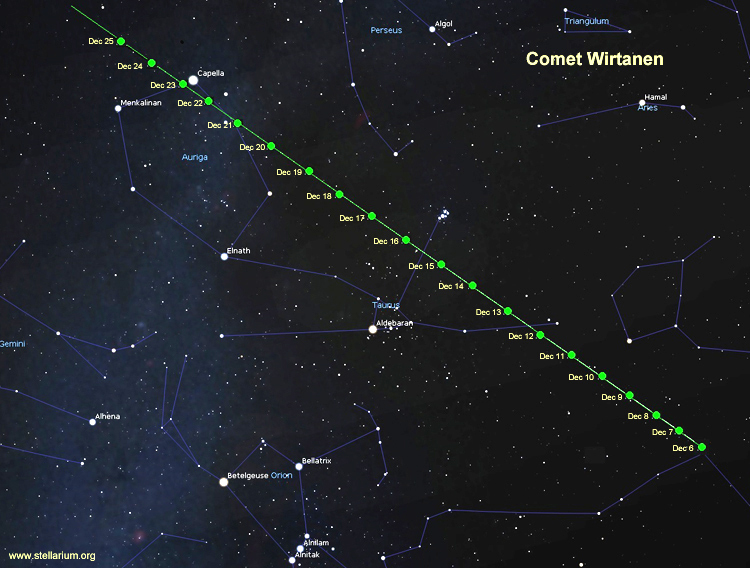 Normally comets are not visible unless seen through a telescope, however the Comet 46P/Wirtanen can now be seen in the sky. The comet will grow and become brighter as it makes its way north throughout December. On Sunday it will be closest to Earth at a distance of 11.5 million kilometres. Over the weekend on the 13th and 14th, the shower as a whole will be at it’s peak. It will have 120 meteors per hour. Particles that are the size of sand from asteroid 3200 Phaethon, a possible dead comet, will vapourize as they hit the atmosphere at 35 kilometres per second. To see the maximum number of meteors, people should watch after midnight when the constellation is highest in the sky. Gary Boyle, an astronomer from Ottawa, says all meteor showers are different in the amount of meteors we see per shower. “Meteors are generated from comets. As comets round the sun they leave debris as materials blow off the comet, and that debris lingers in space, so as the earth goes around the sun once every year we tend to go around these debris fields just like a car races across a finish line,” says Boyle. Each comet gives off a different amount of debris, and the Geminids give off 120 meteors per hour creating a big debris field. Boyle says comets are about the size of a grain of sand or a single pea. “There could even be fireballs from the bigger chunks. Comets are different just like people. They act different ways … it’s well worth going out to see,” he says. The Geminid meteor shower got it’s name from the Gemini constellation. The “id” in Geminid goes back to mythology meaning the kids. The shower is all the “kids” of the constellation. Boyle says the meteoroids can vary in size, “The big flashes are the bigger ones like the meteoroid that entered over Russia 5 years ago. It was the size of a school bus, it lit up the day and caused damage,” he told QNet News. The Geminids are known to have fireballs, and these particles come off an asteroid or a dead comet.